Carlisle’s leading trainers go head-to-head this week in what promises to be a grandstand finish at the course’s final flat meeting of 2018. The Cumbrian track says farewell to the sprinters for another year after Wednesday’s eight-course card with a thrilling finale in prospect. Last year’s top course trainer Richard Fahey has saddled six winners in the season, one ahead of nearest rivals Karl Burke and Roger Fell. All three have strong contenders in the afternoon’s standout race the 8f, Smarkets Betting Exchange Handicap with a £9,700 prize for the winner. Fahey has five-time winner Withernsea, first home in a Class 5 at Beverley last time out, with Paul Hanagan in the saddle. Fell’s Elusive Heights has raced in good company this year, with a third at Thirsk over this distance the highlight. Burke’s London Protocol was twice a winner in France last year, including 44,000 Euros for the Qatar Prix Grand Handicap De Milers on the all-weather at Chantilly. Last time out was over this distance at Kempton when eighth. The trio will be in very good company. Mark Johnston’s Dream Today was a £43,000 Class 2 winner at York on debut last August and has mainly run at that level in 2018. Tim Easterby’s Just Hiss, a winner at this class in York last year, will again have Rachel Richardson in the saddle and will be fancied. As will David O’Meara’s Lamloom, twice a winner at Class 4 this year, and paired with Daniel Tudhope. Seven runners will contest the British Stallion Studs EBF Maiden Stakes for two-year-olds. Hugo Palmer, another trainer who has enjoyed a successful season at Carlisle with four wins from just five runners, has Startego. Buckman Tavern with Rosie Jessop in the saddle goes for Sir Mark Prescott. Johnston, who recently overtook Richard Hannon Sr to become Britain’s most successful winning trainer, has Fraser Island ridden by Franny Norton. Elsewhere on the card, 17 entries will contest the Andersons’ Quality for your Home Handicap over 6f with Fell and Fahey again challenging. 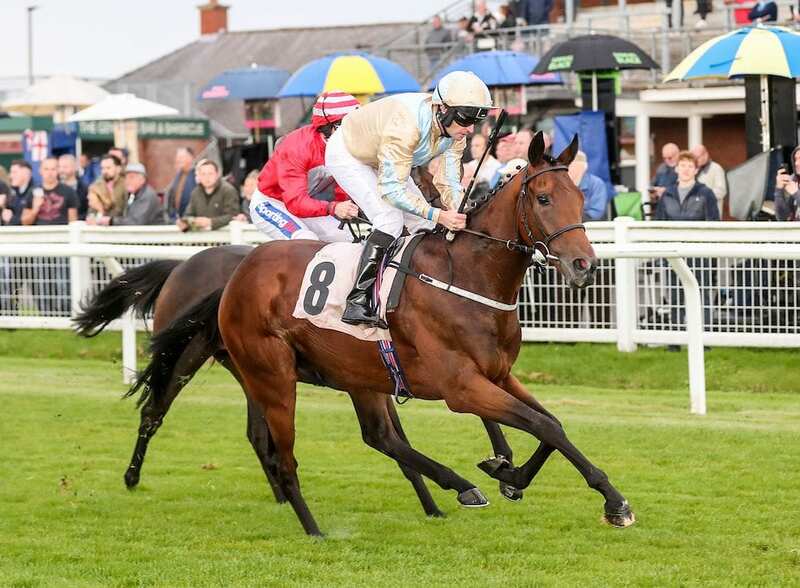 Fahey’s The Right Choice was a winner when favourite over similar distance at Pontefract in May and Fell’s Muatadel has three career victories at this kind of length and most recently was runner up at Doncaster over 7f. Inexes for David Nolan is likely to have supporters. He was placed behind Beverley Bullet at Carlisle over 7f a fortnight ago and has won at Class 4 previously. Mick Channon sends four entries north from his Newbury stables for the meeting. Big Boots in a 6f nursery handicap was a winner on debut at Bath back in May and Apple Anni can count a victory at Beverley this time last year. There’ll be no opportunity to add to his impressive tally of winners for this year’s leading Carlisle jockey, Ben Curtis. The 29-year-old suffered a shoulder injury after being dislodged beyond the finishing post when riding Sugarloaf Mountain to victory at Newcastle on Friday. The fall came the day after riding a brilliant treble at Carlisle that took him to 100 winners in a year for the first time. Curtis, who has twice finished as top Carlisle jockey in the previous three seasons, has 10 winners in 29 rides at the Durdar track this year. That puts him well clear of the next most successful, PJ McDonald with six, and Tony Hamilton with five. Molly Dingwall, Carlisle Racecourse’s General Manager, said: “It only seems like yesterday we were getting ready for the new season and here we are preparing for our flat season finale. Gates open on Wednesday at 11.30am. First race is at 1.30pm, last race at 5.25pm. Adult tickets are £15 (in advance) or £18 (on the day). Under-18s free entry when accompanied by an adult.